If summer's directive is to eke out every last drop of outdoor time, then winter's is to avoid having to put on anything collectively recognized as pants. This recipe, though admittedly at its best when fresh shelling peas are in season, was born of a nearly bare kitchen converging with a hunger for something as deeply comforting as the jammies I was loathe to remove. I hoard risotto rice and peas are a fixture in our freezer. They were my treat, straight from the sack, while riding in the grocery cart when I was young (and just as odd)--and are now a favorite snack of my own (weird) little pea. It makes sense, then, that risi e bisi, which can be thrown together with no planning and very little patience, is northeastern Italy's equivalent of Easy Mac (Annie's for the all-natural set). With the consistency of a soupier risotto, it's warm, creamy, buttery rice dotted with sweet spheres that burst in your mouth. It feels like being hugged (and kissed) from the inside. 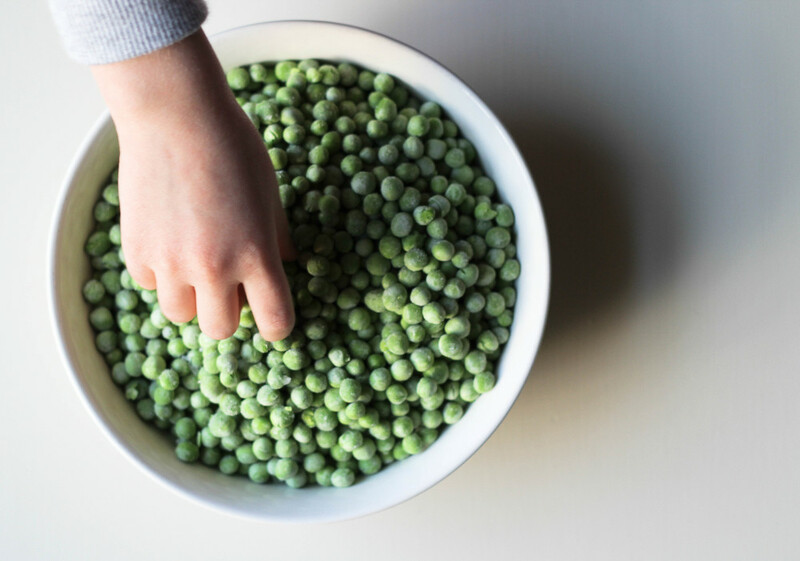 The measure of a good risi e bisi in Italy is having one pea for every grain of rice. You don't have to count, but why don't we? We're not going anywhere in weather like this. In a medium saucepan, bring the stock to a simmering simmer. Meanwhile, in a large, high-sided sauté pan, add the olive oil and 1 Tbsp. of the butter and set over medium heat. Once the butter has melted, add the onion, salt, and pepper, and cook until slightly softened and beginning to turn translucent (but not anywhere close to browning). Add the rice, stirring to coat, until each grain glistens with fat. Now, if you have more than a 1/2 cup of wine in the house, then add it to the rice--otherwise, by all means, drink it instead. The rice will manage just fine without it. Once the wine has mostly absorbed (into the rice, not your bloodstream), add about 3-1/2 cups of the stock, stir, then lower the heat, maintaining an energetic simmer. Cook, covered, for about 15 minutes. Next, stir in the frozen peas and the remaining stock. Replace the lid and cook another 5 minutes. Test that the rice is tender, remembering that the al dente texture of a risotto is not to be expected with this slapdash, hands-free method. Remove the pan from the heat and stir in the remaining 2 Tbsp. of butter, the Parmigiano, and any salt and pepper that's missing. Eat giant bowlfuls, sitting on the couch, wearing something with no buttons or zippers.